Represents a rich text control that supports formatted text, hyperlinks, inline images, and other rich content. One or more object elements for types that derive from Block. Typically, these are Paragraph elements. The RichTextBox type exposes the following members. RichTextBox Initializes a new instance of the RichTextBox class. AcceptsReturn Gets or sets a value that determines whether the RichTextBox allows and displays the newline or return characters when the ENTER or RETURN keys are pressed. BaselineOffset Gets a value that represents the offset in pixels from the top of the content to the baseline of the first paragraph. The baseline of the paragraph is the baseline of the first line in it. Blocks Gets the contents of the RichTextBox. ContentEnd Gets a TextPointer that indicates the end of content in the RichTextBox. ContentStart Gets a TextPointer that indicates the start of content in the RichTextBox. IsReadOnly Gets or sets a value that determines whether the user can change the text in the RichTextBox. LineStackingStrategy Gets or sets a value that indicates how a line box is determined for each line of text in the RichTextBox. Selection Gets the TextSelection in the RichTextBox. TextAlignment Gets or sets how the text should be aligned in the RichTextBox. TextWrapping Gets or sets how text wrapping occurs if a line of text extends beyond the available width of the RichTextBox. 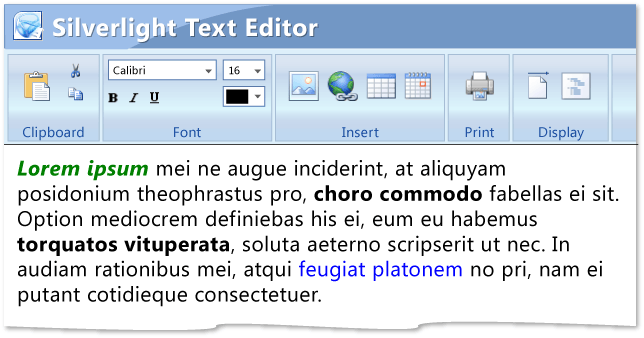 Xaml Gets or sets a XAML representation of the content in the RichTextBox. GetPositionFromPoint Returns a TextPointer that indicates the closest insertion position for the specified point. SelectAll Selects the entire contents in the RichTextBox. ContentChanged Occurs when the content changes in a RichTextBox. You can use the RichTextBox control to display, enter, format, and edit rich text. In this release of Silverlight for Windows Phone, RichTextBox is read-only. The following illustration shows an application that uses the RichTextBox. RichTextBox provides more advanced formatting features than the TextBox and TextBlock controls. You can apply character and paragraph formatting to the text in the RichTextBox. For example, you can apply Bold, Italic, and Underline to any portion of the text in the control. The content property of RichTextBox is the Blocks property, which is based on the Paragraph element. Content can contain many types of elements including formatted text, hyperlinks, and images. You can use the Hyperlink element to display hyperlinks in a RichTextBox. You must set the IsReadOnly property of the RichTextBox to true for hyperlinks to work. You can use the RichTextBox to display text with UI elements that are derived from UIElement, such as images. You can do this by using the InlineUIContainer. RichTextBox has a read-only mode. You can enable read-only mode by setting the IsReadOnly property to true. To apply the same property settings to multiple RichTextBox controls, use the Style property. To change the visual structure and visual behavior of a RichTextBox, copy and modify its default style and template. For more information, see Control Customization. Dependency properties for this control might be set by the default style of the control. If a dependency property for a RichTextBox is set by its default style, the property might change from its default value when the RichTextBox appears in the application. For more information, see Dependency Property Value Precedence. You can get the default style and template for RichTextBox from RichTextBox Styles and Templates. Setting a visual property will only have an effect if that property is both present in RichTextBox control's default template and is set by using a TemplateBinding. You can find a list of visual properties in the "Changing the Visual Structure of a Control" section in Customizing the Appearance of an Existing Control by Using a ControlTemplate. The following table provides information about tasks that are typically associated with the RichTextBox. Use the Paragraph element to set content. For more information, see RichTextBox Overview. Display text with inline UIElement objects such as an Image or a Calendar. Use the InlineUIContainer element. For more information, see RichTextBox Overview. Use the Hyperlink element. For more information, see RichTextBox Overview. Use the IsReadOnly property. For more information, see RichTextBox Overview. Use the Selection property and the TextSelection class. For more information, see RichTextBox Overview. Use the GetPropertyValue and ApplyPropertyValue methods. For more information, see RichTextBox Overview. In Silverlight for Windows Phone, RichTextBox is read-only. The following code shows how to create a RichTextBox with a paragraph and some bold text. A RichTextBox with <Bold>initial content</Bold> in it. 'A RichTextBox with intial content in it. 'Create a new RichTextBox with its VerticalScrollBarVisibility property set to Auto.
' Create a Run of plain text and some bold text. myRun1.Text = "A RichTextBox with "
' Create a paragraph and add the Run and Bold to it.
' Add the paragraph to the RichTextBox. 'Add the RichTextBox to the StackPanel. //A RichTextBox with intial content in it. //Create a new RichTextBox with its VerticalScrollBarVisibility property set to Auto. // Create a Run of plain text and some bold text. // Create a paragraph and add the Run and Bold to it. // Add the paragraph to the RichTextBox. //Add the RichTextBox to the StackPanel.